Gravestone of Mary HOWE, relative of the author. 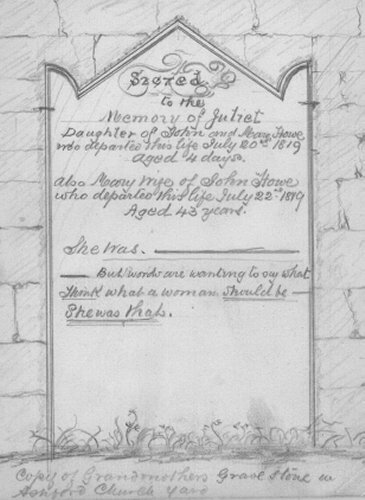 This sketch was made by William DOXEY (also a relative) in 1890, after the gravestone had been moved to the wall of the church, since when the surface has exfoliated, making the inscription unreadable. This is the earliest known example of the much-quoted verse. Mary's husband John HOWE was known as "The Poet of the Peak" and has left a large body of Poetry in a work called "Trifles Light as Air"
who departed this life July 20th 1819 aged 4 days. who departed this life July 22nd 1819 aged 43 years. Think what a woman should be...she was that." Copy of Grandmother's gravestone in Ashford Church yard.